Blunt chest trauma may cause cardiac injury in any of the heart chambers or septal or valvular structures. Ventricular septal defect (VSD), especially when isolated, is a very rare event. Fewer than hundred such cases have been reported in the medical literature. Patients with a post-traumatic VSD are variable in their clinical presentation, course, and severity, and consequently, they may be difficult to diagnose. Echocardiography is the most effective diagnostic tool, although cardiac catheterization, computerized tomography (CT) or magnetic resonance imaging (MRI) is sometimes required for further assessment. 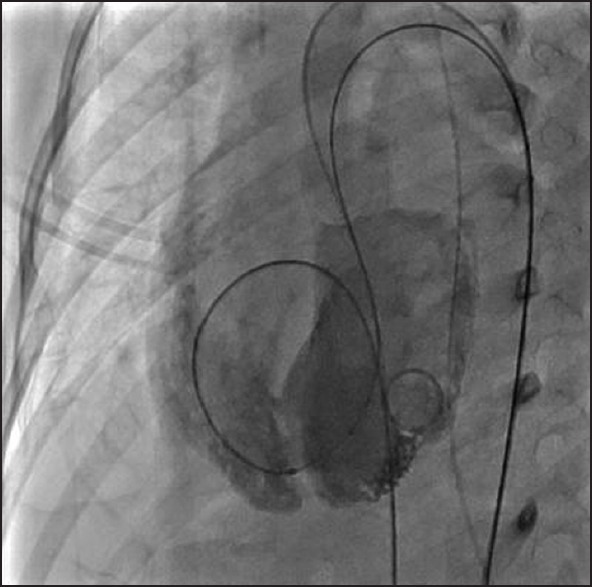 Most patients require cardiac surgical or percutaneous device closure to ensure survival. A previously well 7-year-old boy was hit and run over by a truck. He presented to the local emergency department with evidence of head, chest, and abdominal injury. Clinical examination also revealed a harsh pansystolic murmur at the left sternal border. 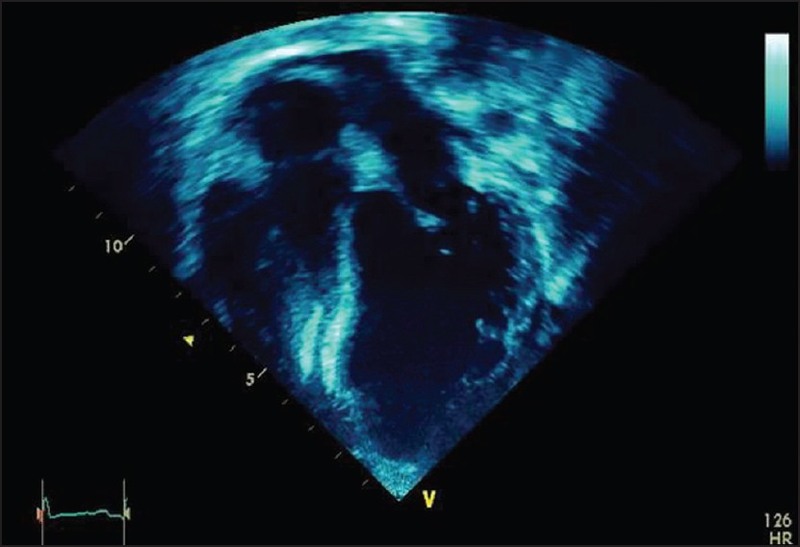 Echocardiography showed an 8-mm muscular VSD near the apex, which was initially thought to be a congenital defect [Figure 1]. The patient was hemodynamically stable and did not require inotropic support. Electrocardiogram showed normal sinus rhythm. Cardiac enzymes were not assayed on presentation. CT of head showed base of skull fracture. 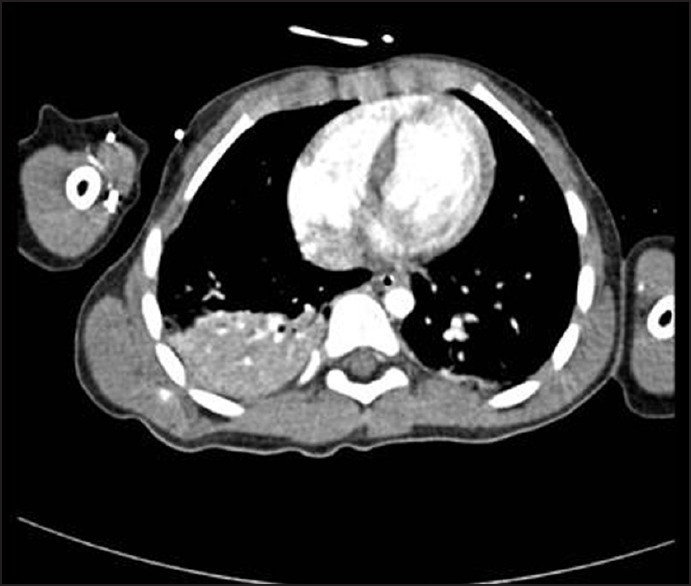 The CT chest and abdomen showed lung contusions at both bases and liver laceration [Figure 2]. Over the course of the next 24 hours, he developed progressive tachycardia, hypotension with hepatomegaly and elevated central venous pressure. He had also developed a right-sided pleural effusion. He underwent emergency laparotomy to exclude persistent hemorrhage from the liver laceration. A moderate volume of old blood was found and this was not able to explain the degree of hypotension. Repeat echocardiography documented ragged walls around the muscular VSD near the apex and significant left heart dilatation and right ventricular strain. The patient was clinically in severe heart failure, which was very difficult to manage medically. In the context of multiple organ injuries, coagulopathy, hemodynamic instability, and technical difficulty in closing the VSD surgically, a decision was taken to close the defect percutaneously. 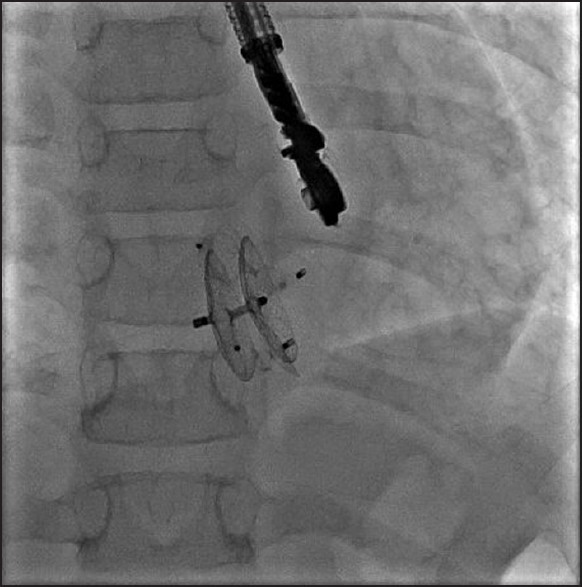 In order to achieve the maximal coverage of the lacerated ventricular septum and in the context of his relatively small weight (23 kg), a 25-mm cribriform Amplatzer PFO device (St Jude Medical, Plymouth, MN USA) was selected. This was placed after forming an arterio-venous guidewire loop through a 7-Fr delivery system [Figure 3] and [Figure 4]. There were no complications. Post-procedure echocardiogram showed the presence of only a small residual VSD, which was anticipated due to the unusual morphology and ragged edges of the traumatic VSD [Figure 5] and [Figure 6]. Despite apparent successful device placement, the patient required high-dose infusion of adrenaline to maintain adequate blood pressure. He also developed acute renal dysfunction and required continuous veno-venous hemofiltration. He had bilateral chest drains inserted for pleural effusions. His hypotension progressively worsened over the next 2 days. In spite of the multiple inotropes, the heart function was moderately reduced. He was already being treated with broad-spectrum antibiotics, adrenaline, vasopressin, and corticosteroids for inotrope-resistant shock. At this juncture, extracorporeal membrane oxygenation (ECMO) was considered as an alternative means of supporting the patient, despite the increased risk involved in view of liver laceration and lung contusion. The role of ECMO support provision in the post-trauma patient was discussed with international centers and it was decided that ECMO would be provided if further deterioration occurred, despite the risk of hemorrhage with systemic anticoagulation. His clinical condition improved progressively with the inotropes stopped at day 5. His recovery over the next 2 weeks was complicated by episodes of pulmonary hemorrhage, bronchial occlusion with casts in left main bronchus, and critical illness myopathy. He was discharged from our intensive care unit after 20 days. At discharge, his heart function had returned to normal. The occluder device was in a good position. There remained a small residual VSD of 5 mm size, with a highly restrictive left-to-right shunt. There were no obvious signs of neurological damage except for the evidence of resolving myopathy. After 6 months of his first device closure, he underwent elective closure of his residual VSD with a duct occluder device (Amplatzer ADOII 6 mm, St Judes Medical, Plymouth, MN, USA) for persistent mild left ventricular dilatation. Following the second procedure, he had no residual shunt with complete resolution of left ventricular dilatation [Figure 7] and [Figure 8]. Isolated traumatic VSD is a rare occurrence in the setting of blunt chest trauma. Autopsy data suggest an incidence of about 1% for isolated VSD and 5% for VSD associated with other cardiac injuries. A literature review on Pubmed identified 21 reports of traumatic VSD in the last 10 years. Apical VSDs with ragged walls are the most common traumatic VSDs. 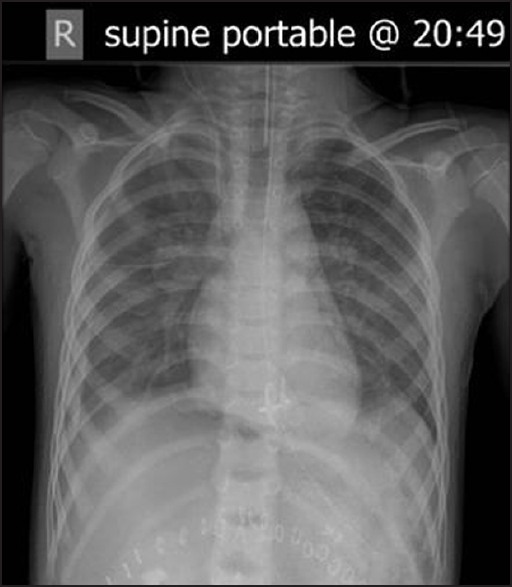 Septal rupture is believed to occur as a result of cardiac compression between the spine and the sternum, although a sudden increase in intrathoracic pressure during deceleration may also be contributory. In cases of free wall rupture, the weakest point for the septum is during late diastole and early systole, when the ventricles are full and the valves are closed. Infarction because of damage to the septal coronary branches is another well-known cause of, particularly delayed, traumatic VSDs. VSD can also result from penetrating cardiac injury involving any part of the septum. The diagnosis of a VSD following blunt chest trauma may be challenging. Investigation should include elements of the history and clinical examination, as well as information gained from plain chest radiograph, cardiac enzymes, echocardiography, and nuclear imaging studies. 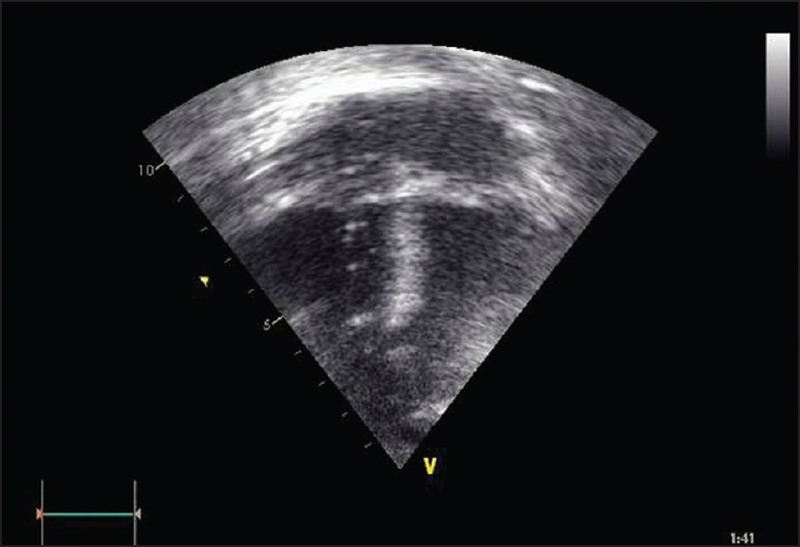 Transthoracic echocardiography is one of the most effective tools for diagnosing traumatic VSD. It provides a rapid and non-invasive method for evaluating hemodynamically unstable patients at their bedside. For patients whose echocardiography fails to provide good-quality images, additional cardiac imaging modalities such as CT or MRI can play an important role. The quality of echocardiography can be impaired by pneumothorax, chest wounds, chest wall thickness, or chest tube insertion sites. Transcatheter closure of a VSD was first reported in 1988. More recently, successful closure of VSDs has been accomplished with a device designed specifically for this purpose: The Amplatzer VSD occlude. , ASD occluder device use was reported in adult traumatic VSD in 2009. We used a 25-mm cribriform Amplatzer PFO device because of the large area of coverage, compared to the small size delivery sheath required, and for its low overall profile. The device remained completely stable despite two episodes of required cardio-pulmonary resuscitation (CPR) due to respiratory arrest. Traumatic VSD is rare in children. Septal rupture is thought to be due to cardiac compression, although sudden increases in intrathoracic pressure during deceleration may contribute. Cardiac enzymes and ultrasound should be routine in all cases presenting with major chest trauma. Transcatheter device closure of traumatic VSDs should be considered the technique of choice even in younger children, as it can effectively address the hemodynamic instability without the risk of bypass surgery and full heparinization. 1. Tenzer ML. The spectrum of myocardial contusion: A review. J Trauma 1986;28:602-8. 2. Tatar T, Ozkan M, Saritaº B, Gürsu A, Aºlamaci S. Postinfarction ventricular septal defect following blunt chest trauma in a 7-year-old child. Turk J Pediatr 2011;53:571-3. 3. Jeon K, Lim WH, Kang SH, Cho I, Kim KH, Kim HK, et al. Delayed diagnosis of traumatic ventricular septal defect in penetrating chest injury: Small evidence on echocardiography makes big difference. J Cardiovasc Ultrasound 2010;18:28-30. 4. Ryan L, Skinner DL, Rodseth RN. Ventricular septal defect following blunt chest trauma. J Emerg Trauma Shock 2012;5:184-7. 5. Pierli C, Iadanza A, Del Pasqua A, Sinicropi G. Unusual localisation of a ventricular septal defect following blunt chest trauma. Heart 2001;86:E6. 6. Lock JE, Block PC, McKay RG, Baim DS, Keane JF. Transcatheter closure of ventricular septal defects. Circulation 1988;78:361-8. 7. Pesenti-Rossi D, Godart F, Dubar A, Rey C. Transcatheter closure of traumatic ventricular septal defect: An alternative to surgery. Chest 2003;123:2144-5. 8. Fraisse A, Piéchaud JF, Aviérinos JF, Aubert F, Colavolpe C, Habib G, et al. Transcatheter closure of traumatic ventricular septal defect: An alternative to surgical repair? Ann Thorac Surg 2002;74:582-4. 9. Suh WM, Kern MJ. 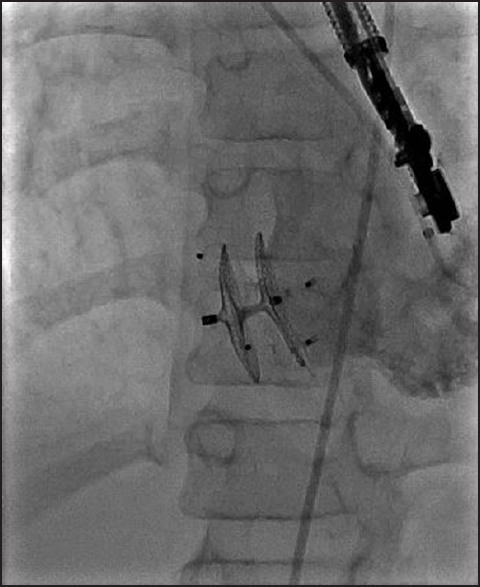 Transcatheter closure of a traumatic VSD in an adult requiring an ASD occluder device. 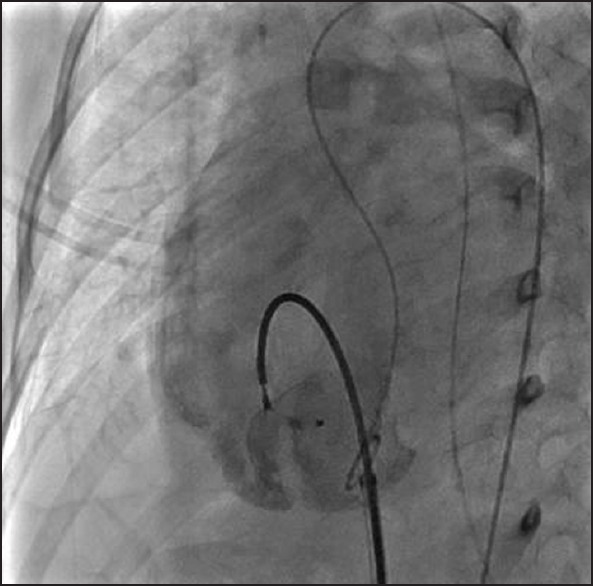 Catheter Cardiovasc Interv 2009;74:1120-5.